You can view your knowledge base hierarchy, and all the categories, sections, and articles that make up the content hierarchy on the Arrange Articles page. From there you can also manage your content structure. You can view the content hierarchy of your knowledge base in Arrange Articles. In Guide Admin, click the Arrange content ( ) icon in the sidebar to open the Arrange Articles page. A list of your categories appears on the Arrange Articles page. Click any category to view the underlying sections, then continue to click items to drill down as needed. Use the breadcrumbs to move back up in the hierarchy as needed. On the Arrange Articles page you can view and manage the categories, sections, and articles that make up your knowledge base content hierarchy. Drill down to see all the levels of your knowledge base hierarchy, down to the articles. Use breadcrumbs to move back up in the hierarchy. Drag-and-drop to manually reorder your top-level categories or sections within a category or articles within a section. You can also set an automatic sort order in edit mode, if you prefer it to manual reordering. Use the options menu to move a section to a different category or to move an article to a different section. Use the options menu to open a category, section, or article in edit mode. Use the options menu to quickly place a category, section, or article at the top of the order in their respective category or section. Use the options menu to open a category, section, or article in Help Center to see the published version. It's great to see improvement in this area, but I can't help and wonder if this means the section nesting (allowing sections to be parents of subsections, and not only articles) is coming next, or if this update being released without that means it's not coming soon? I see this in the section page when it's empty but can't see how to make it happen. Still exciting to finally see this! Yay!!! Hi Alexandra! Indeed, nested sections are coming soon - hopefully by end of March. That's great news!!! Thanks for the info! Literally was just going to ask this same question - my sections say "0 sections, x articles" so I've been trying to figure out how to add sections to sections! Looking forward to the nested subsections. Losing the tree view where we could see all the categories and sections together is a big loss for my team. 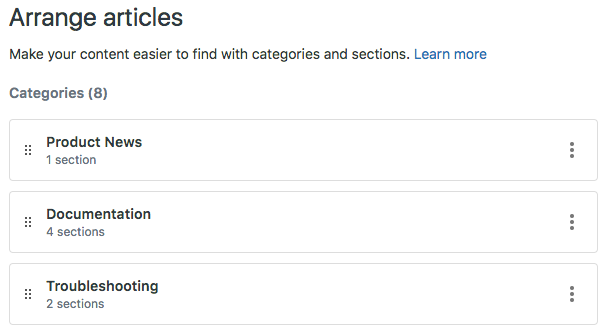 We can no longer effectively review the structure and location of articles within the Zendesk guide tool, and keeping an external category/section map in sync will be a pain. I agree with @Ryansford. It was very useful to see the overall hierarchy of categories, sections, and articles. I can only see the sections in a single category now, so I can't get an overall view of the structure. Any chance this will return? Will sub-sections be available to everyone, including Lite? subsections will be a part of the Guide Enterprise plan only, at least initially. Is there release notes stating this feature will be added to Guide Enterprise only and if so, when will it be added? the feature will be released at the end of March. The announcement will mention that it's Guide Enterprise only, and our marketing department is working on updating the pricing pages to include it. "updating the pricing pages to include it." Will existing Enterprise plan members have this feature included for free? Honestly, I agree with Anthony. It's disappointing that a very simple and extremely necessary feature a) isn't available to everyone and b) costs extra. This is a common feature that I've seen included with most other helpdesk products. To clarify, adding it to the pricing page simply means that we're adding it to the list of features and functionality in the Enterprise SKU. It won't function as an add-on with its own pricing, but rather is a part of the Guide Enterprise plan. In a 'lite' subscription I can understand you wouldn't have subsections. In a 'professional' subscription however, one would expect this feature to be included. Just my two cents. "To clarify, adding it to the pricing page simply means that we're adding it to the list of features and functionality in the Enterprise SKU"
To be fair - I was hoping that was what was meant. I do understand Daan's point. I am already on Enterprise but when creating Multiple Brands, the KB layouts would be a major reason or key factor in going this route. I'll share that feedback with the pricing team. Thanks for posting your thoughts! So I have been re-arranging content in plans for an update to our software. I have an entire section empty now... so how do I delete it? If you click on the three dots on the right-hand side and select "edit section" you should have the option to delete it. @Ershad - Apologies, I missed your question. What were you looking for a response about? I'm liking the new hierarchy layout. However, now that we no longer have the old tree layout is there a way to see a full list of all articles in all sections at the same time? I used to be able to open al the carrots to show all categories, sections and articles at the same time and then be able copy and paste the full list into a spreadsheet for reviewing and analyzing. indeed we no longer have the full list but we're thinking about adding some sort of visualisation.